​“The grace of God is the life of God, and it is poured incessantly upon the world in many ways and at many levels. It is one of the purposes of every religion to provide its people with channels for this outpouring, and to prepare them to take full advantage of it… The clergy exist for the benefit of the world; they are intended to act as channels for the distribution of God's grace.” - Charles W. Leadbeater, Science of the Sacraments. ​Les Couventins de Saint-Montségur (the Conventuals of Holy Montségur) is erected in defense of the Throne of Montségur, and confers Minor Holy Orders upon clergy. Les Oblats de Saint-Sophia (Oblates of Holy Sophia) is dedicated to the Divine Feminine, and confers Minor Holy Orders upon clergy. 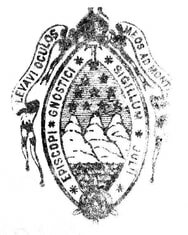 The Servants of the ​Divine Name is the Lay Order which unites ​adherents of the Gnostic faith worldwide in the traditional spiritual practices of the Gnostic Church. The Major Orders are the only true Orders in the sense that only these Orders are part of Christ’s original institution. The Minor Orders came into existence as blessings on the particular labors of laymen who served the Church. It was at a much later date that they became arranged in their present sequence as stages of progress preliminary to the Major Orders. Candidates for Holy Orders must possess a sincere commitment to the French Gnostic Tradition. Candidates for Major Orders must be determined to exercise a regular pastoral ministry. Candidates for Holy Orders must be baptized in a recognized Church. Candidates for ordination to the Priesthood must be baptized and confirmed members of the EGA/EGCA. Clergy who have received Minor Orders in concordat churches may apply to transfer into the EGA/EGCA. Clergy are expected to be men and women of good character. A criminal background check is conducted on candidates for Holy Orders. Clergy work under the obedience of the Church and with the approval and supervision of senior clergy. ​No clergy of our Church may be paid or compensated by the EGA/EGCA of North America or by his or her local church. Local churches of the EGA/EGCA are supported by their clergy and by donations. ​Candidates are accepted on a limited basis. Religious Instruction providing necessary instruction related to ceremonies. Theoretical Knowledge teaching the nature and value of ordinations and symbols. Practical Application indispensable to the accomplishment of ministry. A lecture written by the aspirant to facilitate and demonstrate working understanding. Progress in the Holy Orders is a gradual process. Holy Orders are conferred by the determination of senior clergy. Selection for Holy Orders is based on personal interaction and discernment of the candidate’s fitness and preparedness. Progress in the Courses of the Seminary (Athenea Theologica) does not guarantee the conferral of Holy Orders. To receive the Order of Exorcist a seminarian should have completed the Third Course of Theology of the Athenea Theologica. The order of Sub-deacon is a period of review and discernment for both the Subdeacon and the Church. Not all Seminarians or Subdeacons elect or are elected to receive Major Orders. A Deacon may be ordained for permanent service as a Deacon, or on the path to becoming a Priest. After one year a Deacon is eligible for ordination as a Priest. To be ordained to the Priesthood, a seminarian will have successfully passed written and oral examinations. There are no fees associated with any Church Order or Institute. However, when there is no local Church in which the clergy person can receive direct supervision and ordination from senior clergy, training and ordination usually requires travel to senior clergy numerous times, at the candidate's expense. ​Persons who are interested in becoming adherents of the Gnostic Church, but who cannot travel periodically over a number of years, may be well suited for the Gnostic Lay Order, the Servants of the Divine Name.